One of the things we both really wanted to do coming to Kauai was hike! This is the Garden Island, and it's true to its name. The center of the island is the wettest place on Earth (meaning it receives more rain than anywhere in the world). The scenery is absolutely gorgeous. Green, lush, & colorful land that spills into the beautiful teal & blue ocean! 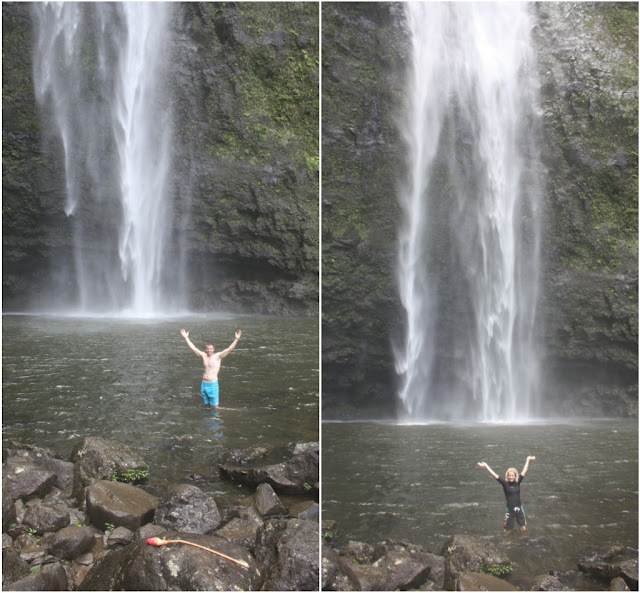 The hike to Hanakapiai Falls is 8 miles round trip. After the first two miles, you land at a beautiful beach, then another two miles - you are at the falls. The falls were prettier than I imagined. We both got in, but I couldn't go underwater... it was cold! It's not a hard hike, but you definitely need endurance on the way up, we were racing up the hills and it was a great work out. It was also really muddy - so we slipped and slid a lot! The hike took us about 4 hours and we had a wonderful time! Thank you for all your sweet comments on my last post (especially about my hair) - I am still getting used to it! We are off for another day of adventure in Kauai! Wow that looks like such a wonderful hike and then lovely reward with the waterfalls and views...so pretty! Your hair still looks super adorable on you! Glad you are having so much fun! Wow those pics are stunning!! Hope you have a good vaca.! wow, i love waterfalls. they look so amazing. Look like you two had a brilliant time. How you do with your photos layout like this? Such a beautiful place!!! i love hiking in tropical places. So many wonderful discoveries around every corner. SO JEALOUS! I am dying to get to Hawaii! Have a blast! what a beautiful place! those pictures are wonderful! The views look amazing! I can't get over that waterfall!! What a great hike!! It looks fun and beautiful! So pretty! We went to a similar waterfall when we were in Oahu. The hike was only 1.5 mile each way though! Hiking sounds good! That way you can indulge on vacation and not feel guilty. Looks beautiful! Wish I was there instead of in my office right now! Hi! 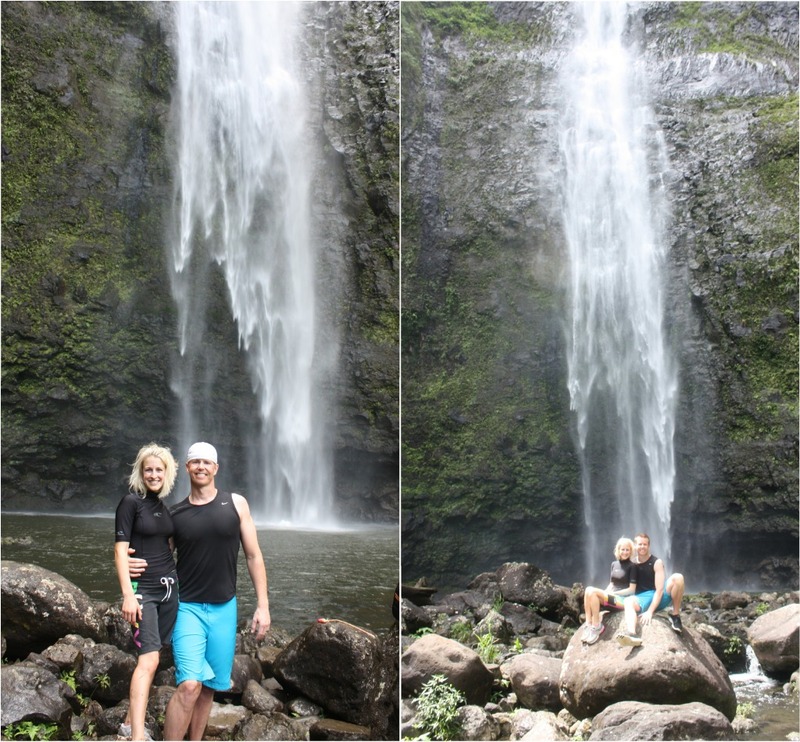 My husband and I went to Kauai on our one year anniversary (8/22/09) last year, and we loved it. 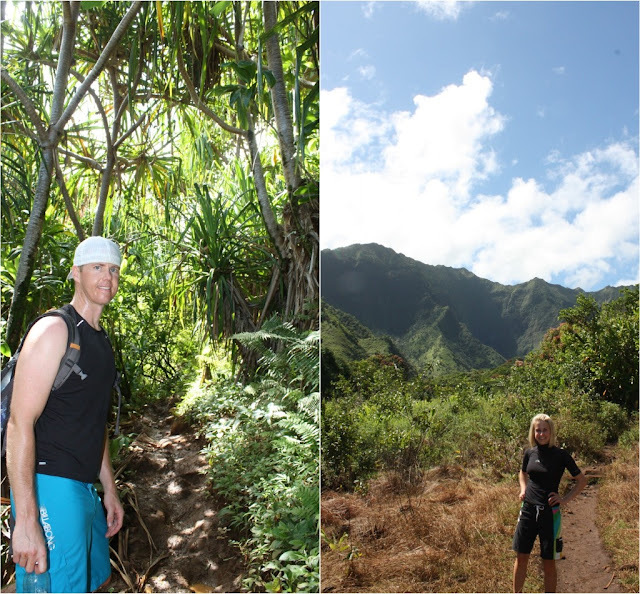 We stayed in Poipu at the Grand Hyatt, but did the same hike. We only made it to the small beach because I slipped and fell on the rocks crossing over to the beach. I was bummed we couldn't make it to the waterfall! Have a wonderful time, and definitely do the Helicopter Tour of the island if you can. So worth it! And eat at Plantation Gardens in Poipu...favorite meal! So gorgeous! 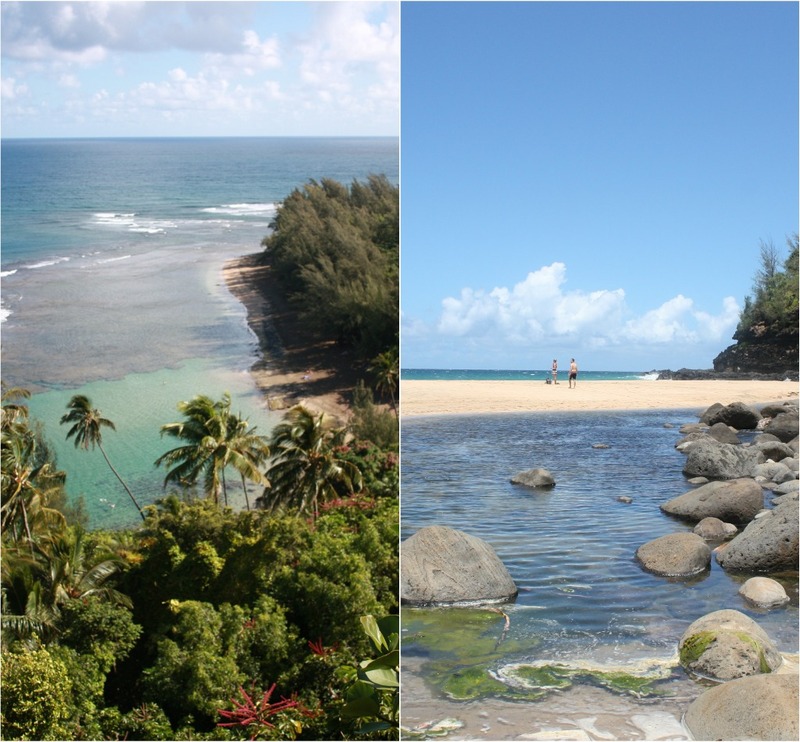 I love Hawaii but I've been when to Kauai before. Enjoy the rest of your vacay! That waterfall is just AMAZING! Such cool picttures! So gorgeous! I'd love to do this. How cute are you?! Seriously! Looks like yall are having a blast! Wow, talk about gorgeous! And I totally missed the boat on your hair, it's adorable! I've tried short cuts before, but because of my curls it ends up looking like the triangle haircut a la Cathy from the comics! NOT good! Seriously that looks BEAUTIFUL and sounds like such a great place to go hiking!! beeeeeeeeeautiful! This looks exactly like what I want to do RIGHT NOW! We had such a blast in CA... such a blast.. but it was so hustle and bustle. I'm longing for the smell of the ocean and the sound of nothing but the waves! :) You guys are too cute and I am LOVING your hair! LOVING! I have actually been thisclose to cutting mine recently and seeing yours makes me want to do it more! I really want my bangs to grow just a tinge more but then I wanna do it! You look great! XOXO!